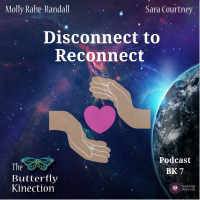 Molly and Sara discuss the ways in which we can become more connected to ourselves and others and how to bring that to the forefront of our lives. Electronic devices may give the appearance of connecting to others, however physically being around someone, speaking to them, and feeling their loving comforting energy is needed for us all to have a deeper connection in general. When we are disconnected and speaking to others through our devices, we tend to misinterpret, make assumptions, judge, and fear confrontation because that physical and emotional connection is absent. Decide how important social media really is and try to keep a balance between being on devices and spending time with yourself and other people. Call someone who means alot to you and have a genuine phone conversation. When you have experiences with people and yourself use all your senses- Feel, hear, see, smell. When you start to connect with yourself and with others, you will then start to connect with your soul. That is the core of what we are trying to get to, our soul connection.